Ted Cruz -- attempting to hold on to the narrowing possibility that he can wrest the GOP nomination away from front-runner Donald Trump -- faces a crucial Indiana primary on Tuesday. Meanwhile, and perhaps ominously for Cruz, he has run into headwinds among Republicans at the national level. His image has essentially nosedived over the past week or two, while Trump's image has become more positive. 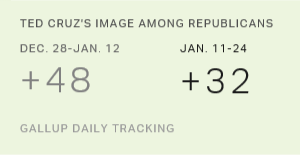 Republicans' views of Cruz are now the worst in Gallup's history of tracking the Texas senator. His image among Republicans and Republican-leaning independents is at 39% favorable and 45% unfavorable, based on April 24-30 interviewing, for a net favorable score of -6. The last few days have marked the first time we have seen Cruz's image underwater since we began daily tracking in July. Republicans consistently held much more positive than negative views of Cruz from last July through January of this year, but then their unfavorable ratings of him began to climb. After a holding period of sorts in March and early April, Cruz's image began to deteriorate significantly in the last two weeks, with his positive and negative lines crossing in the middle of last week. His current -6 net favorable rating is a far cry from where it was in late December and early January when his net favorable was +48, some 54 points higher than today. Cruz now joins the ranks of several other GOP presidential candidates whose images among Republicans fell into net negative territory. South Carolina Sen. Lindsay Graham and former New York Gov. George Pataki hold the records for the worst images during the 2016 campaign; both of them had net favorables in the -13 to -14 range last August. Former Virginia Gov. Jim Gilmore had a -11 in August as well. On the Democratic side, two former candidates also had net negative images -- former Virginia Sen. Jim Webb with a low of -4 in early September, and former Rhode Island Gov. Lincoln Chafee with a -2 at various points in August. In sharp contrast to the recent trajectory of Cruz's image, we find Trump's image on an upswing in recent days. 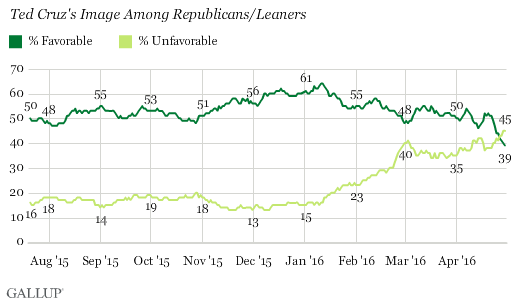 For the period from April 24-30, Trump had a 59% favorable and 35% unfavorable image among Republicans, for a +24 net favorable. That's not Trump's high point (he was at 63% favorable, 30% unfavorable in late August and early September), but his rating is up in recent days even as Cruz's has gone down, putting more and more separation between them. The accompanying chart shows the pattern of movement between the two GOP candidates over the past nine months among Republicans -- based on net favorable ratings. 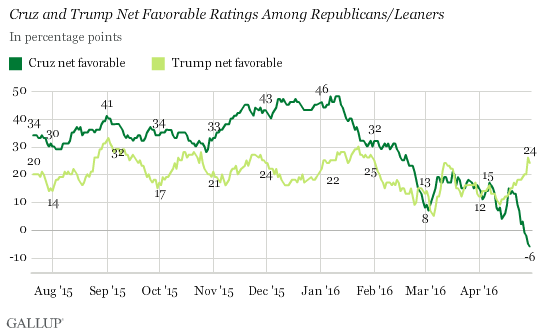 The remarkable aspect of this trend line is the degree to which since mid-April Trump's net favorable rating has moved steadily upward just as Cruz's net favorable rating has moved steadily downward. Cruz's image was consistently more positive than Trump's from July through the end of February; then the two closely tracked one another before the recent divergence. Despite the big difference in their images among Republicans, Trump and Cruz have roughly similar net favorable ratings among all national adults at this point (interviewing through April 30): -29 for Trump and -25 for Cruz. Trump is much better liked among Republicans than Cruz, as we have seen. Both men are severely disliked by Democrats, as one would imagine, but for Trump, that dislike is more manifest. 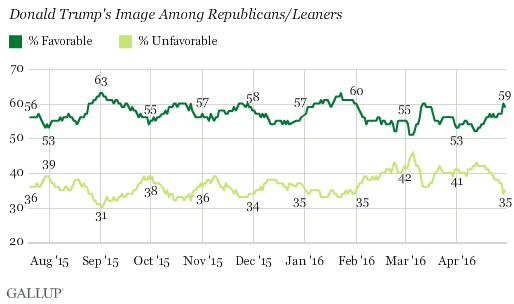 Trump has a -75 net favorable image among Democrats, while for Cruz it's -45. Trump thus has a tough challenge ahead of him should he win the GOP nomination, given the evident antipathy he engenders among anyone who does not identify as a Republican. One consolation for Trump: Hillary Clinton's net favorable rating among Republicans at this point is -74, nearly the same as Trump's rating among Democrats, the opposing party. Clinton, however, has a +47 net favorable among her native Democrats, about twice as high as Trump's current +24 among Republicans. Bernie Sanders and Ted Cruz have adopted strong, and opposing, positions on the ideal role of government. Americans support neither of these positions, and would prefer debate and compromise on the issue, rather than rigid ideology.